Last night my little sister Tawni and I had the opportunity to go to Capitol Theatre in downtown SLC. The tickets landed in my lap through a friend who unfortunately (or fortunately, for us) couldn't go. It was opening night and a full house. We had excellent seats, actually. The show stayed pretty true to the Disney cartoon. It included a few new songs, a couple of which I really enjoyed. Simba's "Endless Night" and "They Live in You" were great. I could almost quote the entire show because the writer's didn't change the script that much. Rafiki, to my surprise, was a woman. A sassy monkey woman. She was hilarious and a superb singer. Mufasa, Pumbaa, and Timon had voices that were very similar to the cartoon characters. The symbolism in the show was neat and unique. The scenery was incredible along with the costumes. I wonder how they came up with everything the way they did. Brady, that's awesome!!! 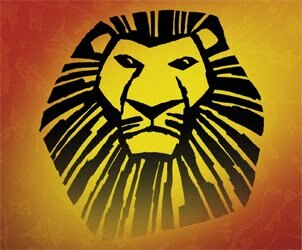 I've ALWAYS wanted to see Lion King and I've ALWAYS wanted to see Kyle Korver. Just kidding about the latter... I have seen him and it was wonderful. Lion King, the movie, is BY FAR my favorite Disney. Gotta love anything Africa. I am sure you had the best looking date there... and so did Tawni (even with Korver in your midst!). Glad you got to go. Shellie and i went in Las Vegas last month - it was amazing! Loved the costumes. Oops - that last comment was from me - Joan. We're here in D.C. visiting Kenny and Christan again. This time for Bailey's baptism.